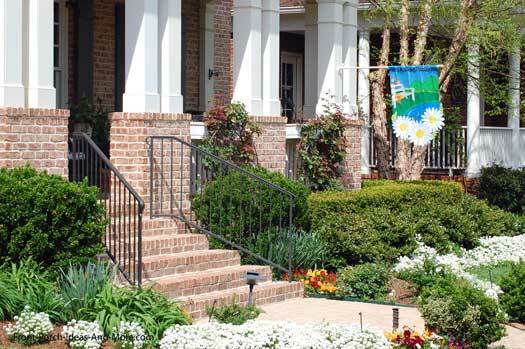 Our landscaping pictures will undoubtedly give many ideas for your own yard. 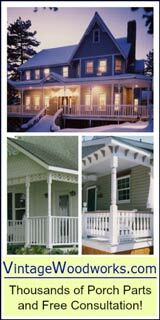 Not only will our home landscaping photos highlight beautiful yards but will also show you some fantastic porches as well. 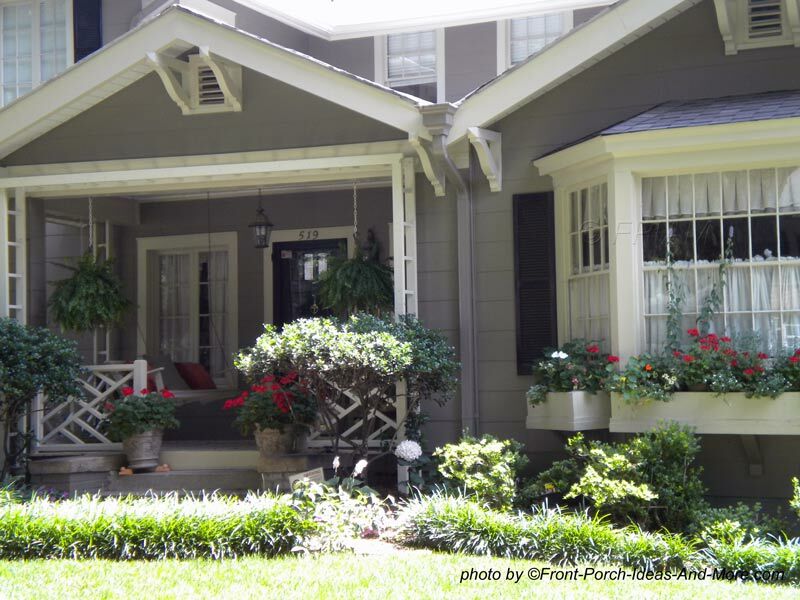 Landscaping around your porch can increase your home's curb appeal, be environmentally friendly, and give you hours of pleasure. 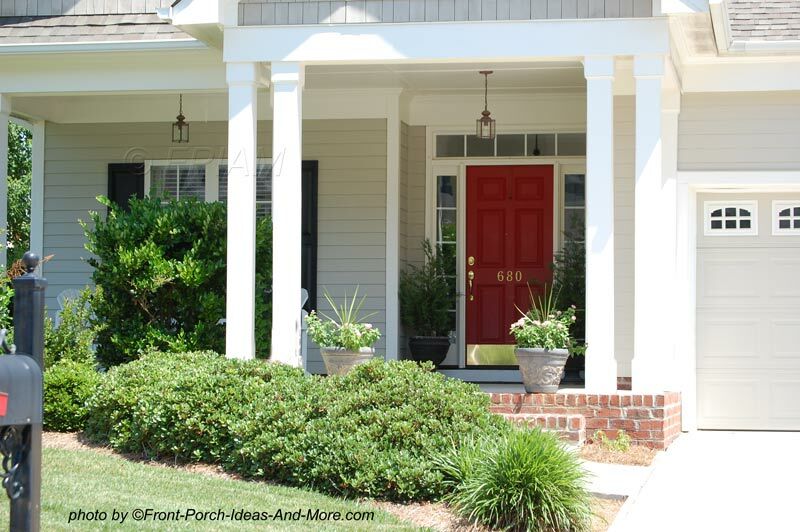 Who loves a nicely landscaped porch? 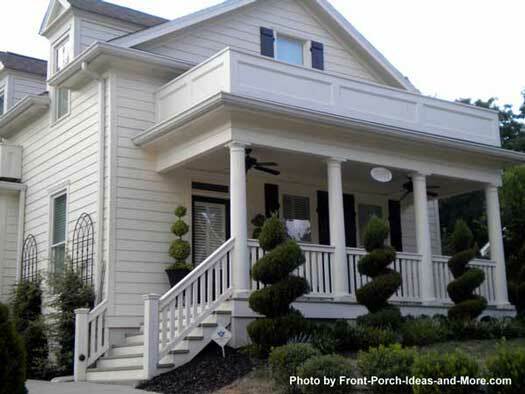 Replicate the landscaping depicted on our photos or combine ideas from various photos to create even more ideas for your yard. 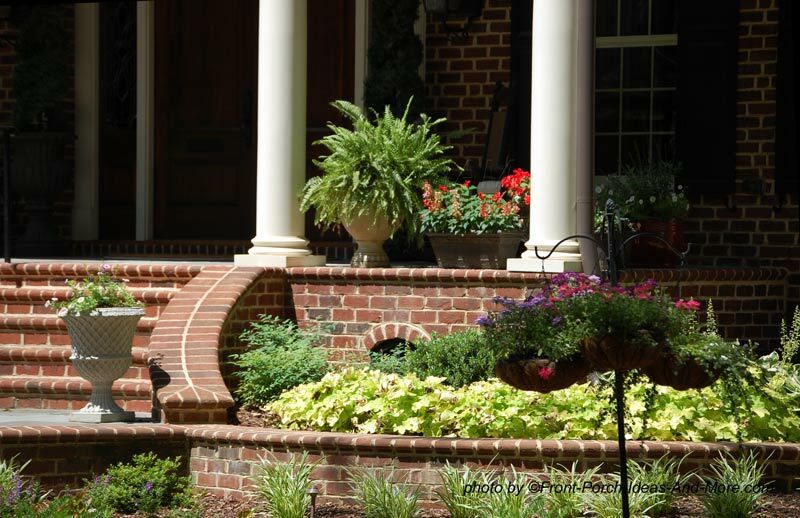 Study the pictures carefully to see how various plants, shrubs, trees, edgings and walkway ideas are integrated to create curb appealing landscaping. 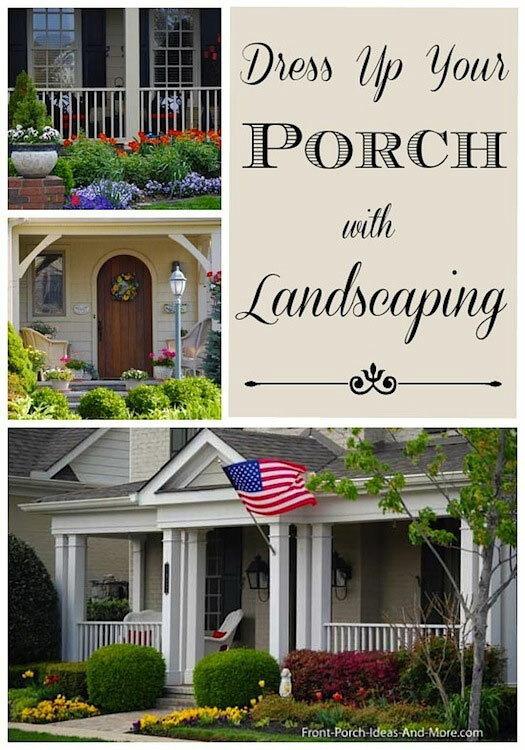 Not only do we have many landscaping pictures on this page but we also have many other ideas for landscaping your yard throughout our site. 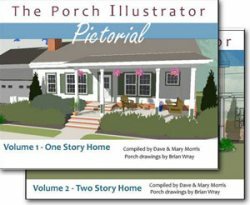 Many of the home landscaping photos you will see were taken by Mary and I on our porch photography trips across the country. 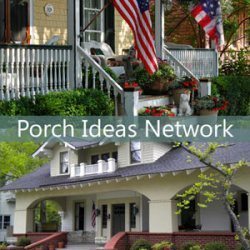 Please feel free to send us your porch or landscaping projects and we may feature them on Front-Porch-Ideas-And-More.com to share with others. Landscaping pictures are water-marked and copyrighted; please do not use without permission. 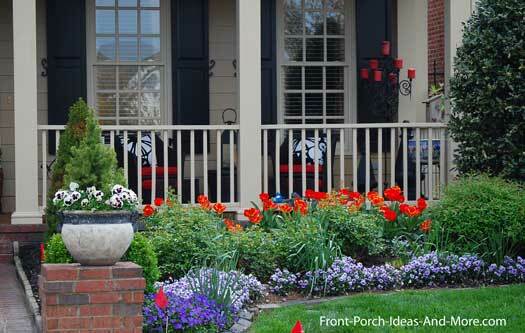 Want to add color to your front yard landscaping and in particular, highlight your front porch? 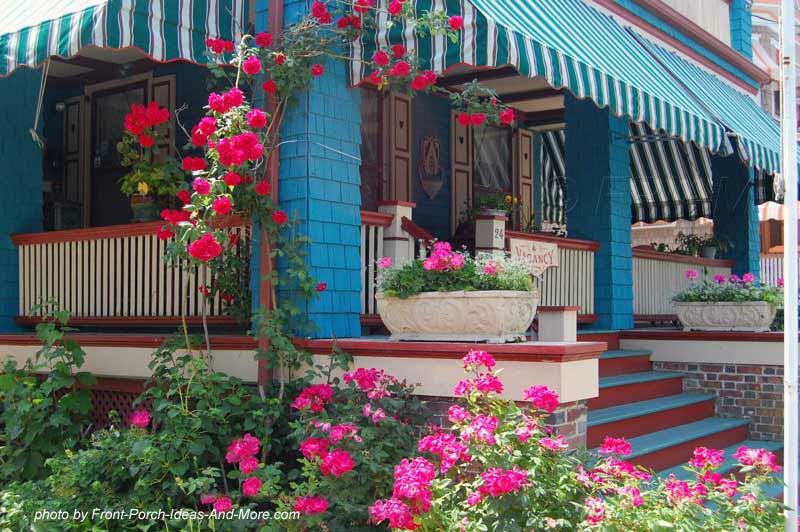 Perennial flower gardens may be your answer as they are all about color. 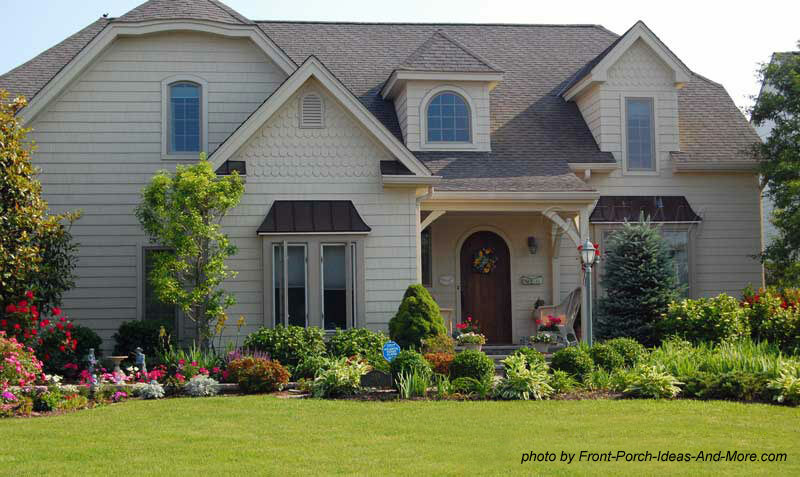 One common mistake many people make is mixing too many colors in the landscaping. By doing so, you never really know where to focus; your eyes do not see along the entire border. Mixing too many colors is like looking at a kaleidoscope - just too much to take in all at once. Using the same plants and the same colors tends to create a natural flow. Staying with reds, oranges, yellows, whites, and sometimes blue works much better most of the time. 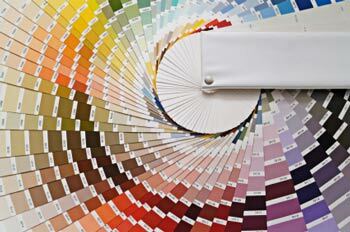 An easy way to get it right and to see your options is to use a color wheel. 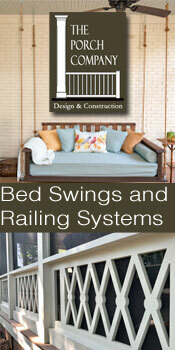 It will ensure you select the right combination for your yard. 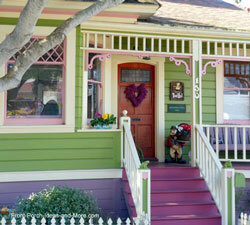 For ideas on how to use color and a color wheel be sure to see our Color Section. 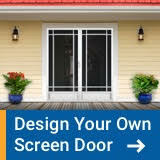 Whether you are planning a large yard landscaping project or prefer small yard landscaping ideas, it is most important to account for your home's architecture and your lifestyle too. 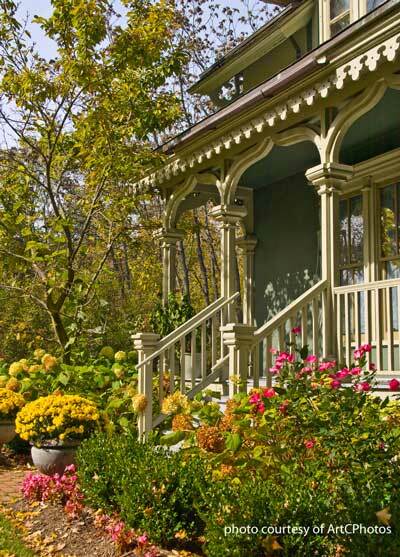 For instance, formal gardens may look rather odd around a cottage-style home. Or, if you like gardening, regular maintenance may not be an issue. 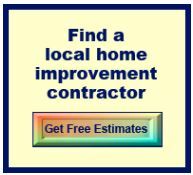 However, if you'd rather spend time doing other things, you will want to install easy maintenance landscaping. 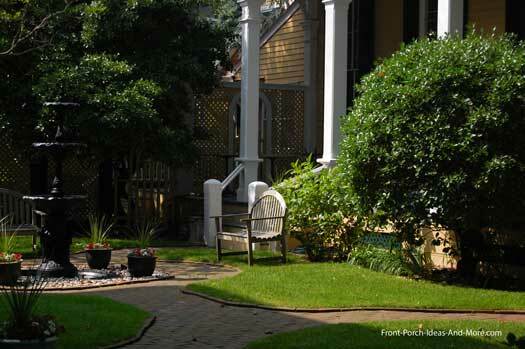 The photo above depicts a more formal style of landscaping - geometric shapes in this case. 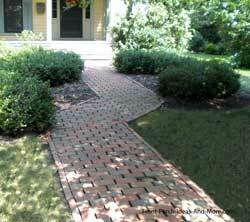 Formal landscaping may also use straight lines along with orderly arrangements. 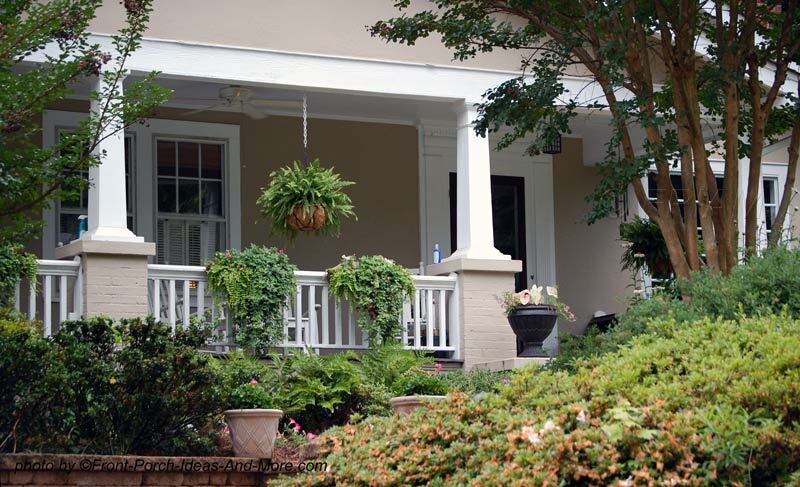 Formal landscaping often also requires frequent pruning. 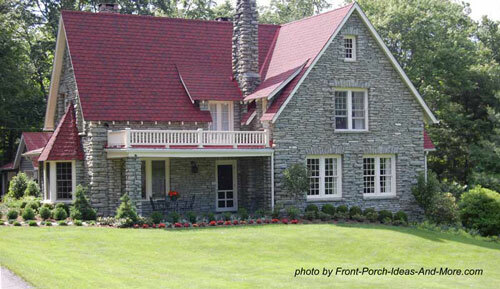 Conversely, informal landscaping works well with almost any architectural style home, but lends itself very well to cottages, Victorian, farmhouses, and ranches as depicted in the photos above. Random is the key. 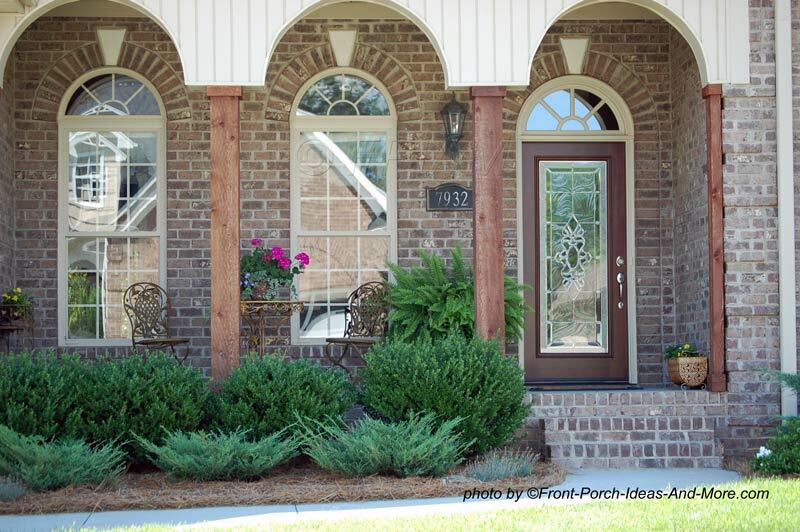 You may find curved edging and a variety of foliage. English gardens try to blend the house's architecture with that of the foliage. They range from the simple but sophisticated to the very colorful as depicted in the photos above. 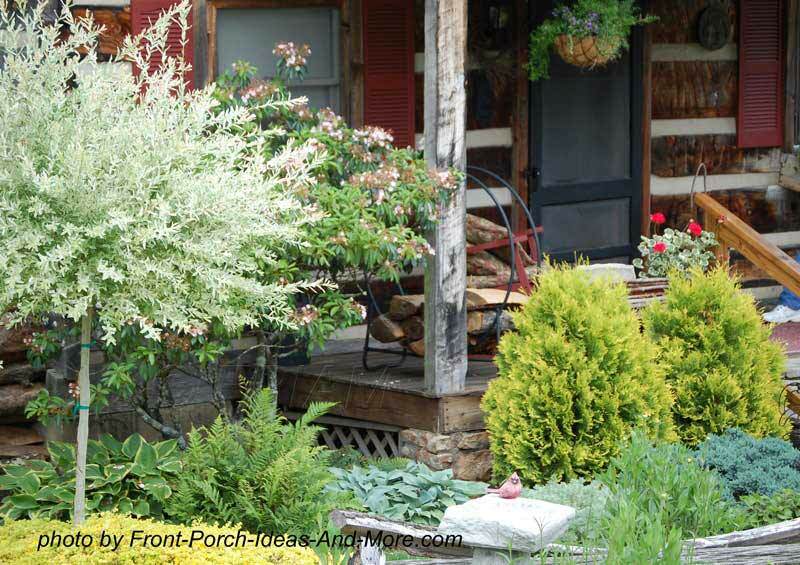 Informal landscaping, like in the landscaping pictures above, gives you lots of options. 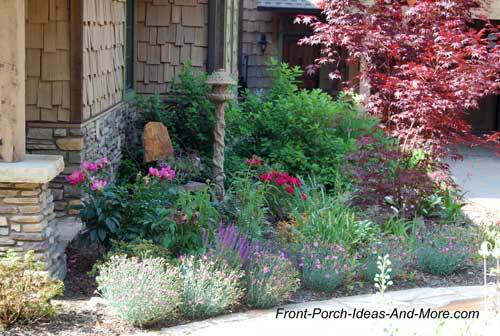 Many include walkways, rocks, wildflowers, annuals and perennials of various kinds. Beds may or may not have defined borders. It is often the kind of garden found in small backyards. It uses rocks, evergreens and water. A wide variety of plants create several interesting angles with this style. 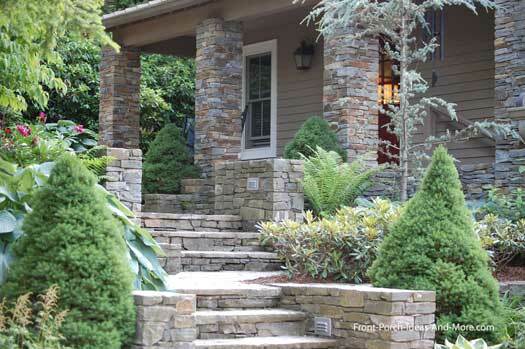 Woodland landscaping uses plants that complement or mimic those found naturally at the building site. 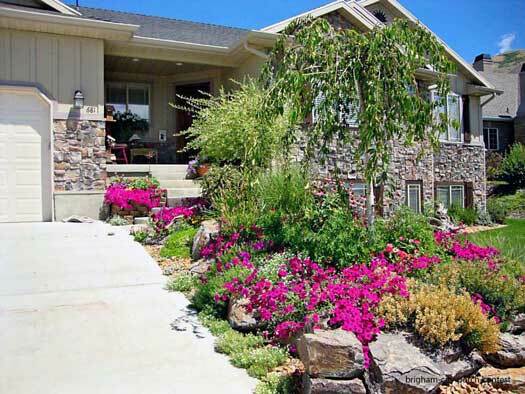 This type landscaping is also very useful with sloping yards. 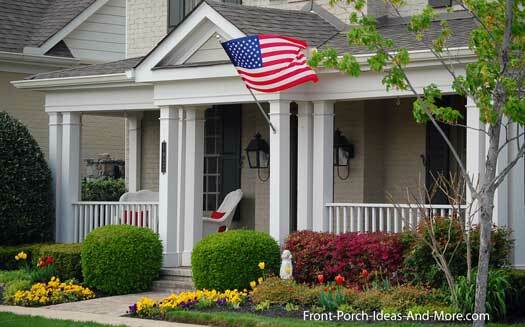 Here are a few more tips for landscaping around your porch and yard. 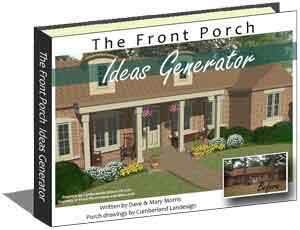 View: Make sure you can see the landscaping whether sitting on the porch or looking out a window. 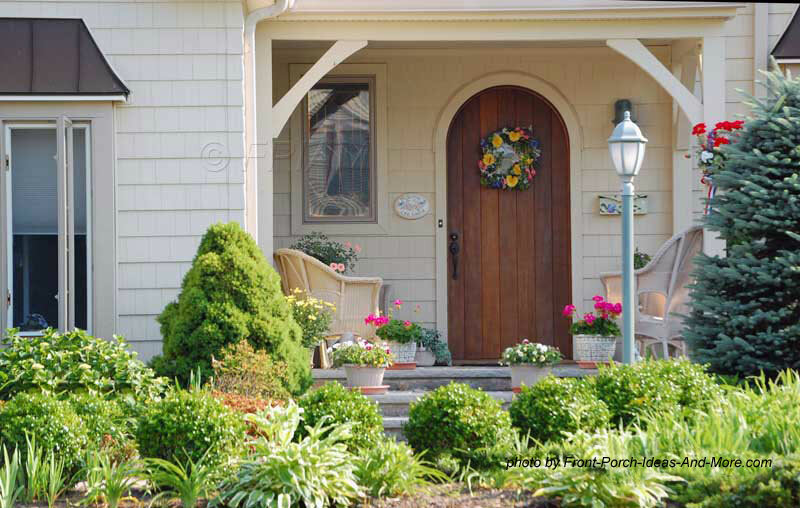 Use plantings to emphasize walkways to your front door and other visually appealing sites within your yard. Likewise, you can use landscaping to hide objects that you'd rather not see. Color: Make room for color! It doesn't have to be a lot but a splash of color is just plain fun. 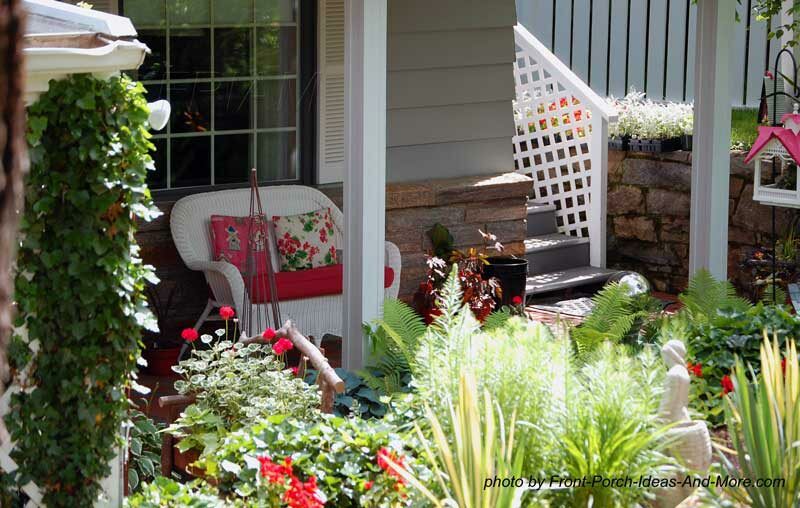 Texture: Include a variety of textures among your plantings for interest. Repetition: Plant in groupings throughout your landscaping. 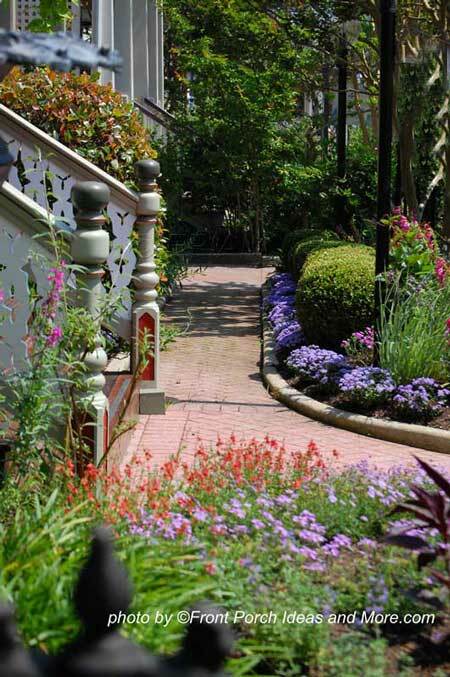 Beautiful Walkway Ideas: Highlight your walkways. 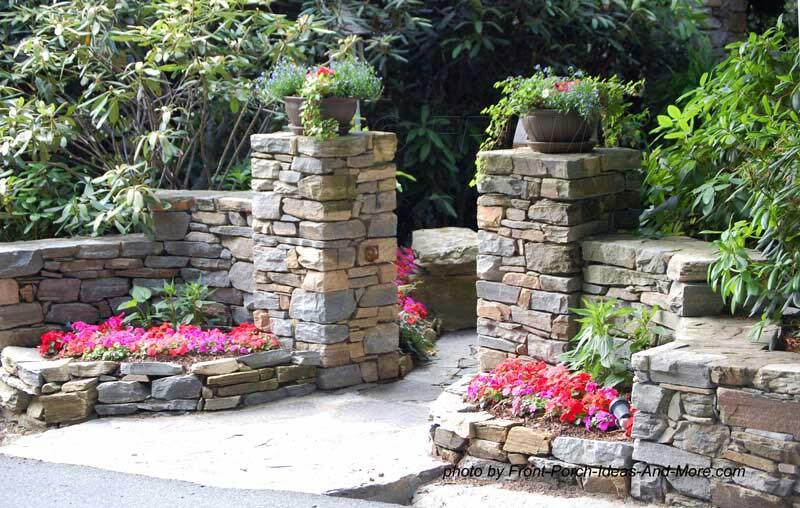 They are normally easy to landscape and it will add interest to your yard. 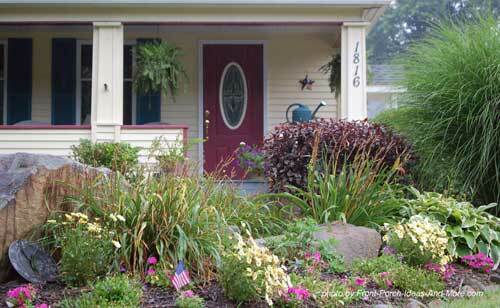 Be sure to see our 10 easy and fun landscaping ideas! 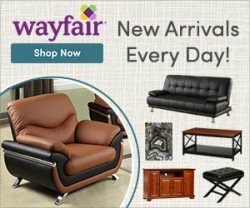 We have so much more for you see, especially if you are planning a landscaping project or want more ideas from landscaping pictures.